A grinning Pai told the crowd he was not expecting the award. By the time the chairman took the stage to champion big business during day two of the conference, at least eight businesses had announced they were severing ties with the NRA and no longer offering discounts to its members. Gizmodo reported earlier Friday that the security company Symantec and its subsidiary LifeLock had cut ties with the NRA following First National Bank and Enterprise Holdings, which owns three separate car rental companies. MetLife and Simplisafe, a Boston-based home security company, made similar announcements soon after. After the award announcement, Pai, O’Reilly, and Carr took turns patting themselves on the back for rolling back the net neutrality rules. 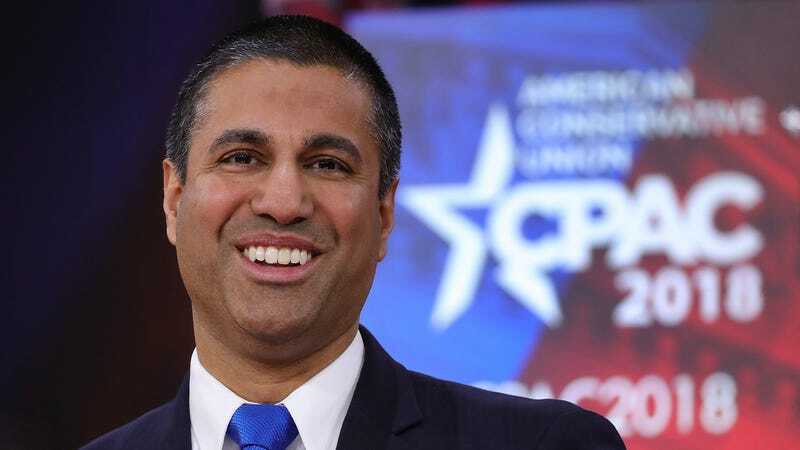 In mid-December, Pai, Carr, and O’Reilly voted in favor of an order which overturned rules meant to prevent broadband providers from blocking or throttling content or creating “fast lanes” to provide better service for companies that pay for it—essentially abdicating the agency’s authority to regulate the nation’s largest telecommunications companies. The agency is current being sued by several net neutrality advocacy groups, as well as 23 state attorneys general, who allege the decision by the FCC’s Republican majority violates federal law and turns companies like AT&T and Verizon into “gatekeepers” of the internet, permitting them to manipulate online traffic to their own profit. In 2017, the NRA gave Vice President Mike Pence the same award. “The award is a flintlock rifle, it’s what the mainstream media calls a high-powered weapon of war, so we left it out back,” an NRA spokesperson said at the time.